Bus from Penang to Kuala Terengganu is the most convenient mode of transport to connect people to East Coastal Malaysia. Many residents in Penang and travellers rely on this budget express bus service to travel to Kuala Terengganu, a gateway to Perhentian Island and Redang Island, for vacation. Kesatuan Express is the only bus operator serving bus from Penang to Kuala Terengganu. Locals favour the brands because of long service history and excellent bus service. Kesatuan Express provides only 1 daily trip in the evening. The bus fare for bus from Penang to Kuala Terengganu costs RM 50.50 only. 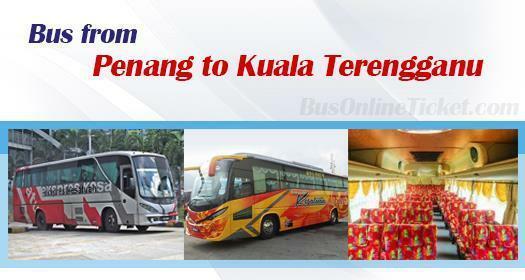 Duration required for bus from Penang to Kuala Terengganu takes about 7.5 hours to 8.5 hours, depending on traffic and weather condition on the departure day. With the long hour journey, Kesatuan Express deploys VIP coach with spacious seats to ensure passengers having good sleep during the trip. The boarding point for bus from Penang to Kuala Terengganu is either Sungai Nibong Bus Terminal or Komtar Pinang. The arrival point for bus from Penang to Kuala Terengganu is MBKT Bus Terminal. Passengers arriving at Terminal Bus MBKT can take taxi to Shahbandar Jetty or Merang Jetty for ferry service to Perhentian Island and Redang Island. With limited bus schedules daily for bus from Penang to Kuala Terengganu, passengers are advised to book bus ticket online in advance to prevent disappointment. All you need to do is go to BusOnlineTicket.com, choose your destination and departure date and time, and pay through our secure payment gateway. After that, you will receive a confirmation email instantly once payment is done.